Need to stretch your apps budget? 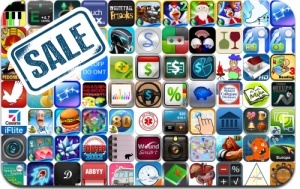 Here are 76 iPhone, iPad and iPod touch apps that just went on sale. This app deal alert includes Chicken Invaders 2 & 3, Cave Quest, Pengu Wars, Loco Train, iOOTP Baseball 2012 Edition, Christmas Eve Crisis, Epoch., Hyperlight, Gardenscapes, Dreams of a Geisha, Braveheart, iLoader 1 & 2, Rate A Wine, and many others.